Mark Hunneman, an ordained Presbyterian minister, while recuperating from some health issues, began watching “Ghost Hunters” and other paranormal investigation programs, both with fascination and alarm. Observing the recent explosion of interest in ghosts and the supernatural, as evidenced in books, TV, and movies, he questioned how a belief in ghosts coincided with traditional Christianity, where the Bible stood on the existence of ghosts, and why God would allow ghosts to exist. 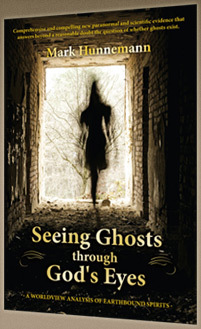 Hunnemann’s investigation led him to reading and analyzing popular books by people who claim they can talk to ghosts, including Mary Ann Winkowski, to interviewing religious demonologists who seek to exorcise demons, and to watching numerous episodes of paranormal investigation programs and popular fictional shows such as “Ghost Whisperer” to understand popular—and misguided—beliefs about ghosts. Mark even relates that he has had his own frightening encounters with the supernatural world. This array of research led him to some strong conclusions. Far beyond simply compiling evidence of the supernatural, Hunnemann applied common sense and logic, and most importantly, his own Christian beliefs as sifted through the Bible to answer the hard questions about whether ghosts exist, and if so, why. Hunnemann examines most significantly the biblical worldview of life, man’s place in the world, and what kind of God would permit people—even babies—to become ghosts. His well-reasoned analysis is centered upon answering seven biblical worldview questions: 1) What is the Nature of God? 2) What is Your Purpose in Life? 3) What is the Nature of Reality? 4) What is the Nature of History? 5) What is the Basis for Morality? 6) What are the Essential Traits of Being Human? and 7) What Happens to Us After We Die? Hunnemann realizes that many of his readers will be skeptical both to the truths of the Bible as well as to the possibility that ghosts exist. He does an excellent job of anticipating his readers’ questions and objections, never shying away from difficult questions or trying to soften hard answers his readers may not like to hear, but he is also open to and understanding of their skepticism. Hunnemann relates some of his own story, including the death of his college age brother that left him angry at God and questioning God’s existence or goodwill toward man, as well as his own reaffirmation of faith. What I most admire about “Seeing Ghosts through God’s Eyes” is Hunnemann’s earnestness in discussing his subject. While many people are dismissive about ghosts, he emphasizes that the Church must take note of how interest in the supernatural is growing, and take a stand upon this issue. He also logically explores the popular theories behind how people become ghosts and shows the fallacies in many of these theories. For example, why would Hitler be allowed to be a ghost and thereby escape eternal punishment, and where is the logic in a child who dies in a fire missing her chance to go into the light when she dies, thereby being trapped on earth? In short, Hunnemann sorts through the “mumbo-jumbo” to reveal the most logical answers about ghosts’ existence, and he provides plentiful evidence from paranormal investigations and biblical scripture to support his conclusions. Some readers who question the Bible’s authenticity or inerrancy or who have difficulty believing in the tenets of Christianity may not be open at first to Hunnemann’s arguments, but most of them would be rejecting the book before giving it a chance, and Hunnemann skillfully anticipates and answers those arguments as well as points readers to additional resources. I admit that while I had some skepticism both about ghost theories as well as certain aspects of Christian theology, I found this book fascinating. In fact, I could not put the book down, and even when I did, I found my thoughts absorbed with the information found in “Seeing Ghosts through God’s Eyes.” Beyond just the question of ghosts, I came to a greater philosophical and biblical understanding of God and His love for His Creation. Even people who do not believe in ghosts or in God will find their attention fully captivated by the revelations in this book. I am certain many readers will find that “Seeing Ghosts through God’s Eyes” will have a life-changing effect upon them by altering and enhancing their worldviews. In fact, in many ways, I think it is a comforting book, because despite some of its frightening conclusions, it results in a clearly thought out analysis on a subject that for a long time has left people confused, but now equips them with knowledge, understanding, and faith where there was doubt.